The weather is still very wet and windy but last Monday the forecast promised us a full day without rain and even some sunshine. My wife had also booked the day as holiday and it seemed too good to be true so we planned to get out for the day and take full advantage of the respite in the weather. The ground is still very wet so we decided to head for a National Trust property rather than risk going for a walk over open land. Dunham Massey or Tatton Park seemed to be ideal because there are paths and chance to wander around a deer park to get some photos of the flora and fauna. We packed our wellingtons because we knew it would be wet underfoot and set off to Tatton Park. The sun was in my eyes so I put on my sunglasses for the start of the journey, but as we went over the Pennines towards Greenfield we could see black clouds on the horizon. I had checked the weather forecast for Tatton Park and it was still showing zero precipitation for the whole day so I assumed that the clouds would blow away before we got there. As we got closer the clouds hadn't moved and arriving at Tatton Park we found it wasn't open on Mondays at this time of year. It wasn't looking good but we headed for Dunham Massey which wasn't far away and hoped that it wasn't closed too. As we arrived at Dunham Massey the rain began and it carried on the whole time we were there. Occasionally it looked as if it might brighten up, but then it didn't. We walked around the deer park for a while and then went to have a look at the winter garden where I took all of the photos in this post. 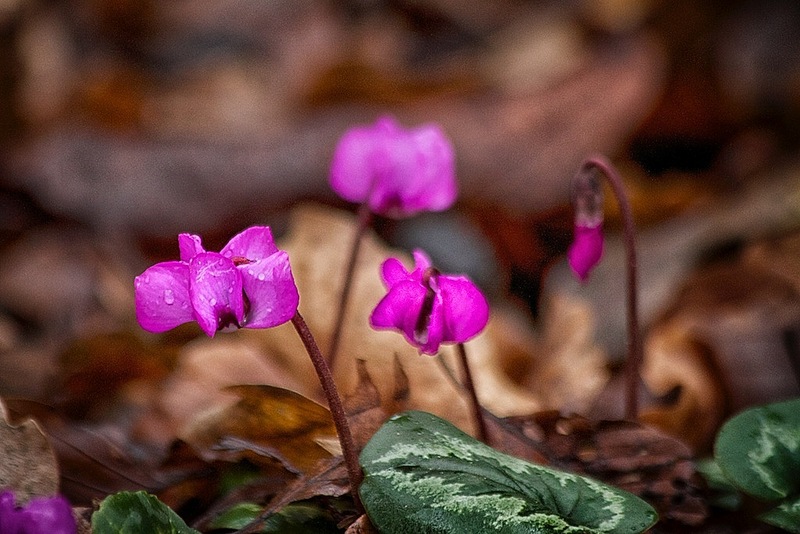 The first flowers we saw where these little pink ones which were well spread out in the border. 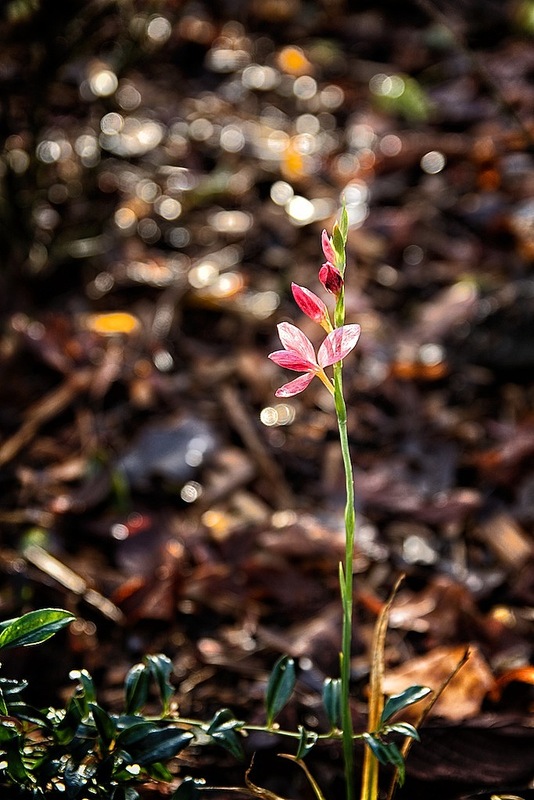 I wanted to get very low for the photo and had to line up the shot using the LED screen on the camera and rely on the camera to focus on the flowers. 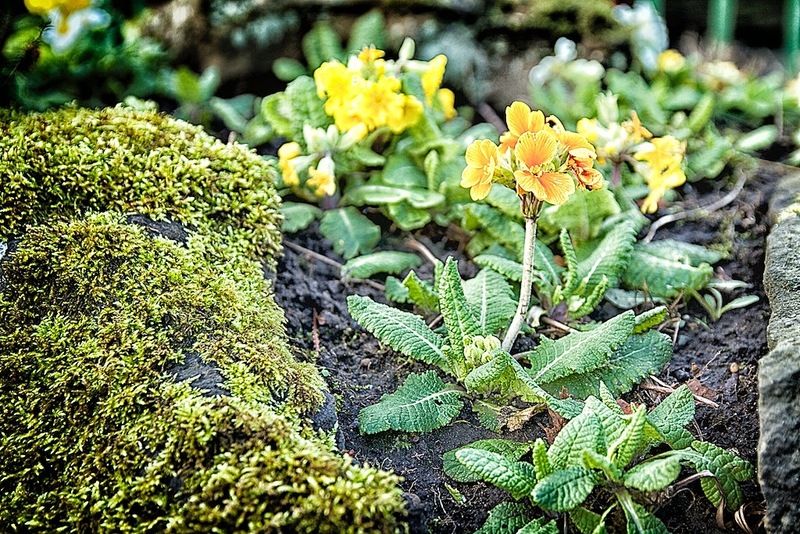 I used a fairly narrow depth of field to isolate these little blossoms from the background in this next photo. 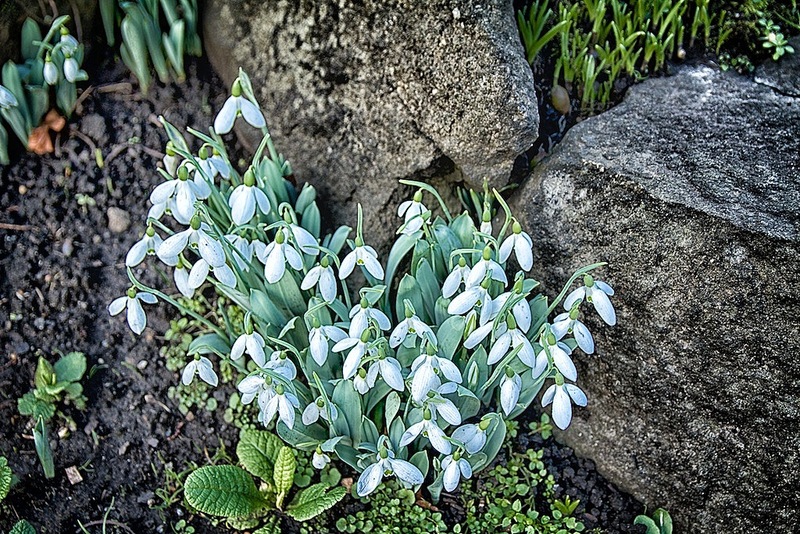 There was a few big patches of snowdrops in the garden and this first photo was taken low and close up to one clump. 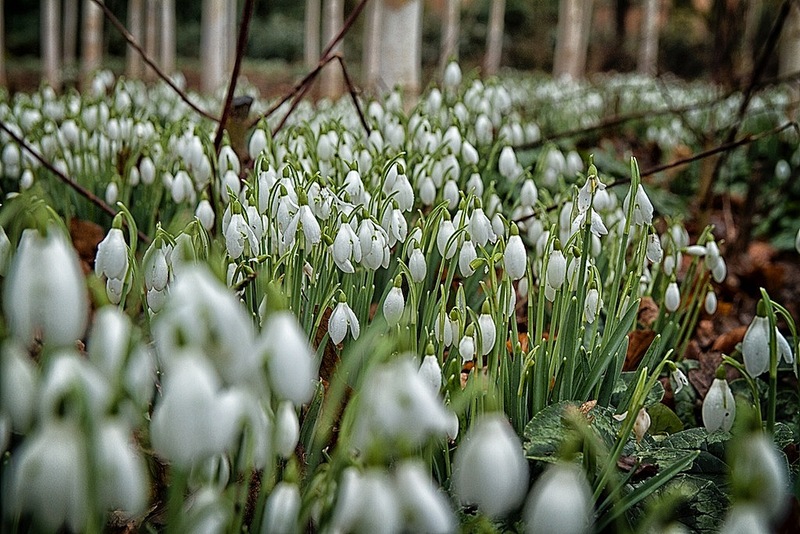 In this second photo I made the camera focus on the snowdrops in the middle distance so that the nearer flowers were blurred out. I also quite like the white barked trees in the background. In this next photo, from near to where the last photo was taken, I have moved back to get the foreground flowers in focus. 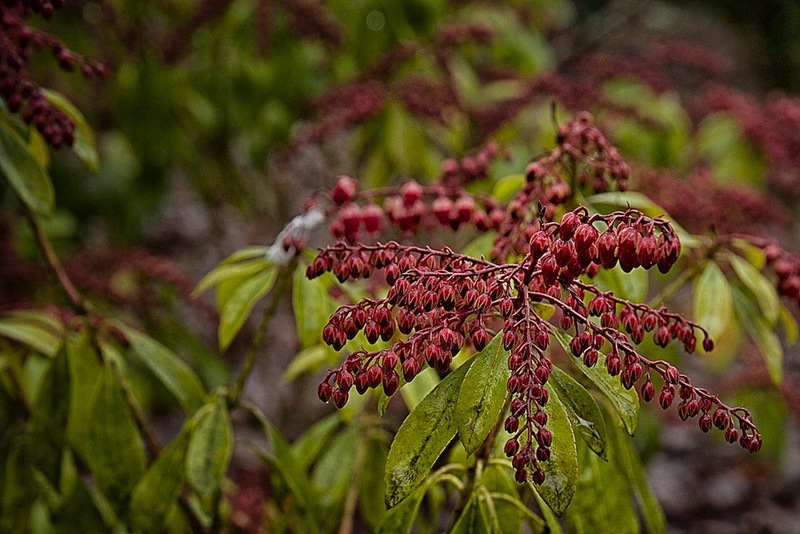 Here are some red blossom on what I think is a type of pieris bush. 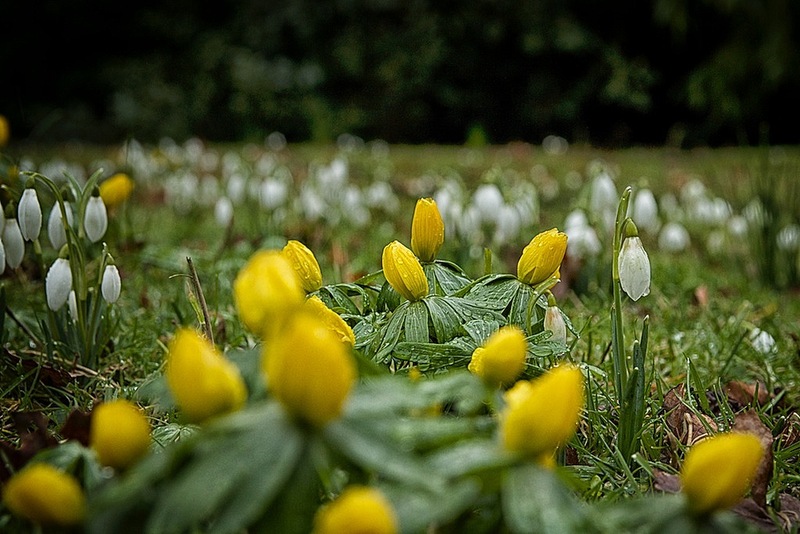 Here is another photo taken very low down of some yellow flowers which were growing between the snowdrops. In the next photo I lifted the camera u a little and pointed it more downwards so that the foreground plant is in focus. 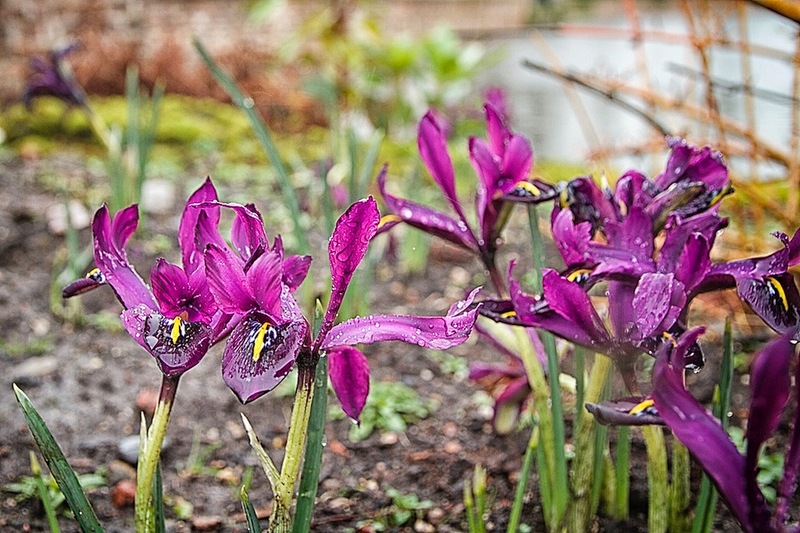 Here are some little purple iris which were at the edge of one of the daffodil beds. The daffodils haven't flowered yet but there was a lot of stalks and leaves around the garden. 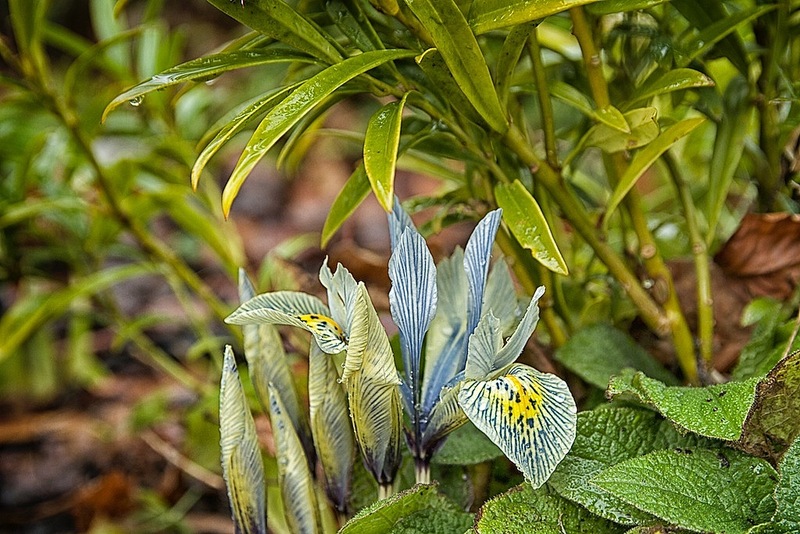 These little blue iris were sheltering under a pieris bush and it was quite dark where they were. I had to boost the light quite a lot to make them look as if they were in a lighter area. 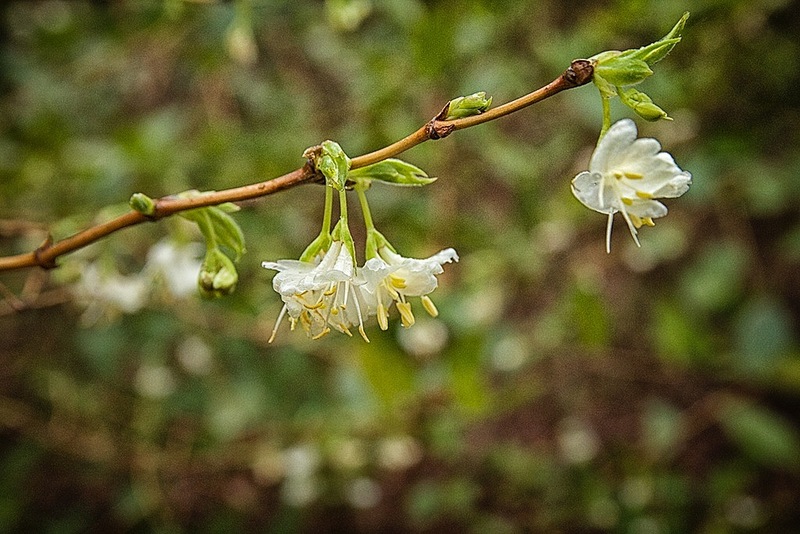 In the next post I might use some of the other photos which I took at Dunham Massey. The thing that really annoyed me about the day was that within 15 minutes of leaving the park on the way home there was little sign of the rain that we had seen while I was trying to take photos. When we got home it didn't look as though it had rained at all. 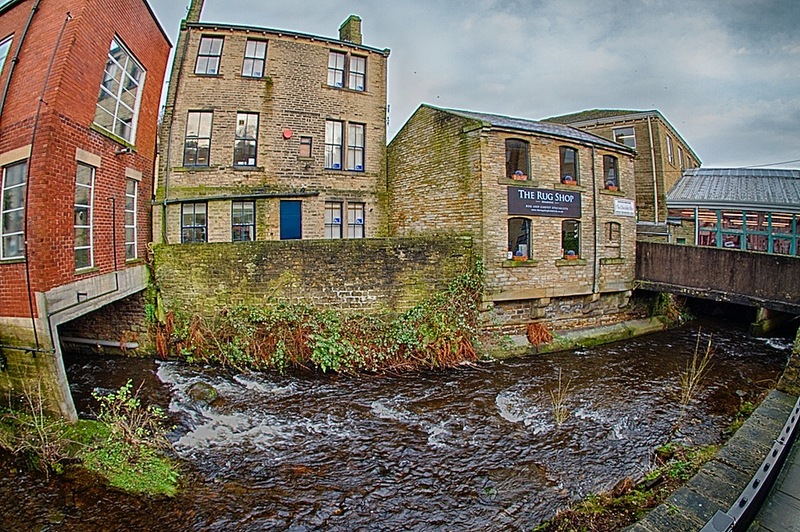 I'm still testing out my new fisheye lens and a couple of weeks ago I had some spare time to walk around Holmfirth while my wife was having her hair done. It wasn't actually raining but everywhere was still pretty damp. This first shot was taken at the riverside path which is over the wall from the Co-op car park. It doesn't show off the distortion from the lens very much but it's a reasonable shot. Up from the river is a little park behind the Post Office building. I found it quite interesting to see the lined pattern on the floor under the benches where the rain has dropped through the seats. 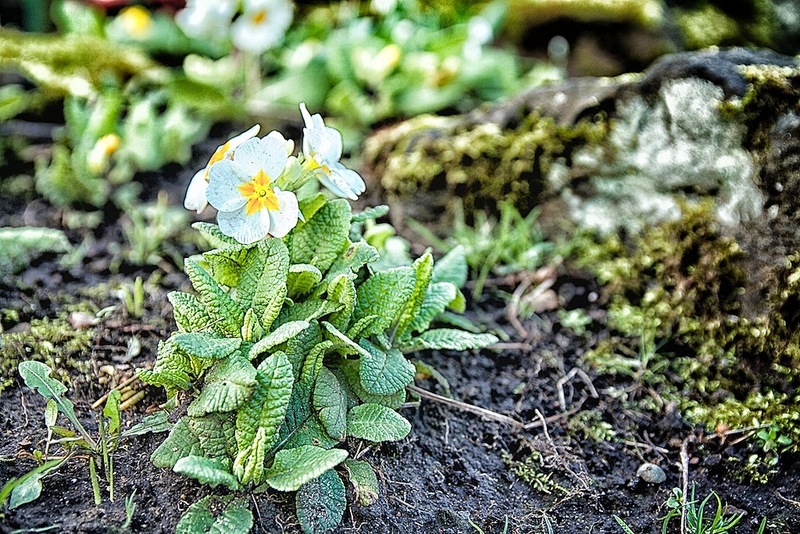 One of the attributes of the fisheye lens is a very short close focusing distance which coupled with the very wide angle of view allows the camera to be placed very close to objects and still take in the whole scene. 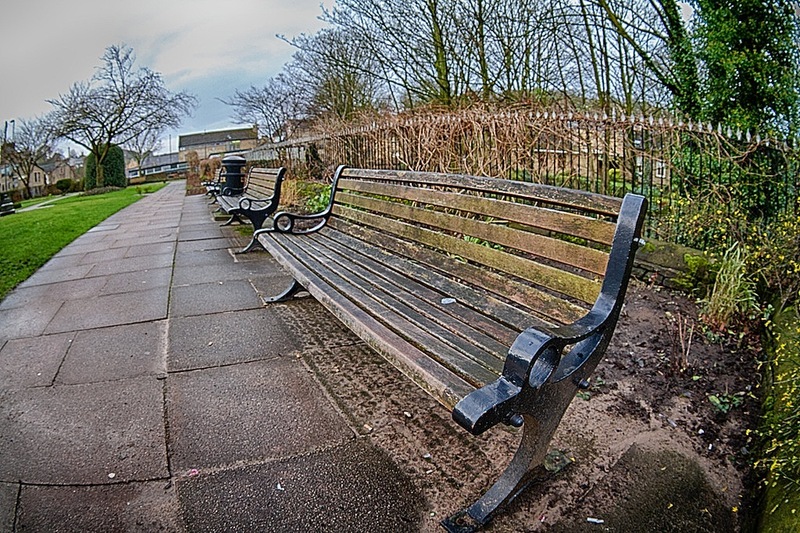 The front of my lens was only a few inches from the metal frame of the bench for this photo. This building is the Picturedrome which was originally a cinema but is now mainly used as a music venue. Sometimes it is used as a cinema and the bar at the rear of the auditorium and the tiny seating area makes it a bit like watching films at home. It is a wonderfully intimate music venue where the audience is stood a few feet from the stage which is just a couple of feet high. The venue attract lots of the old bands and artists plus lots of tribute acts and local artists so has a lot of appeal to all music tastes. 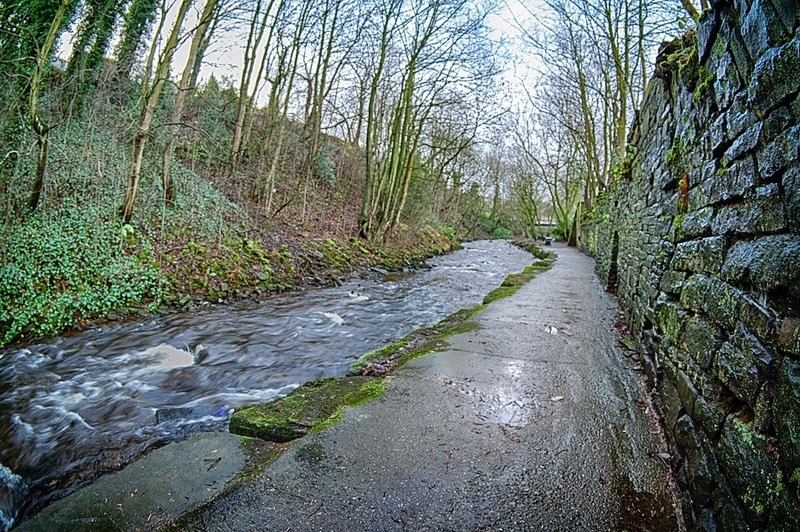 I love the way the fisheye lens has exaggerated curve in the river and brought a large amount of Holmfirth into the picture. 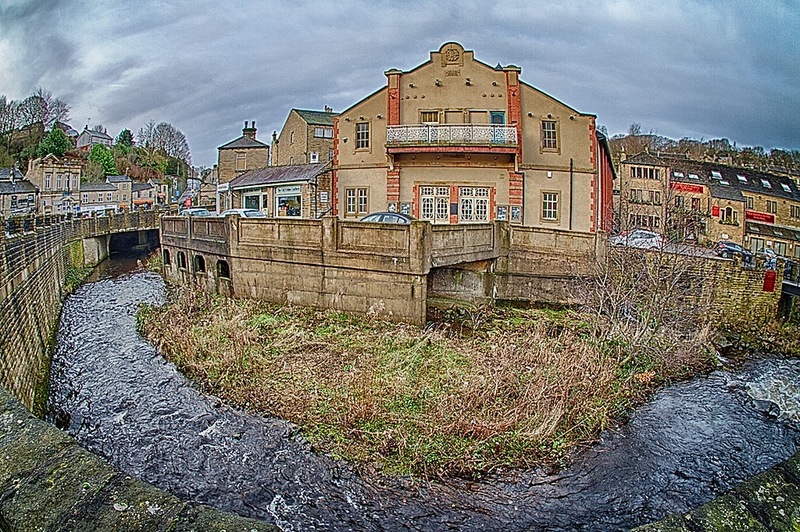 Further up the river are the rear view of the mill shop, some office space and the market hall (which was previously a car showroom). Also the main view of "The Rug Shop" which is across a little bridge across the river. The lens distortion is highlighted quite well in the red brick building on the left. 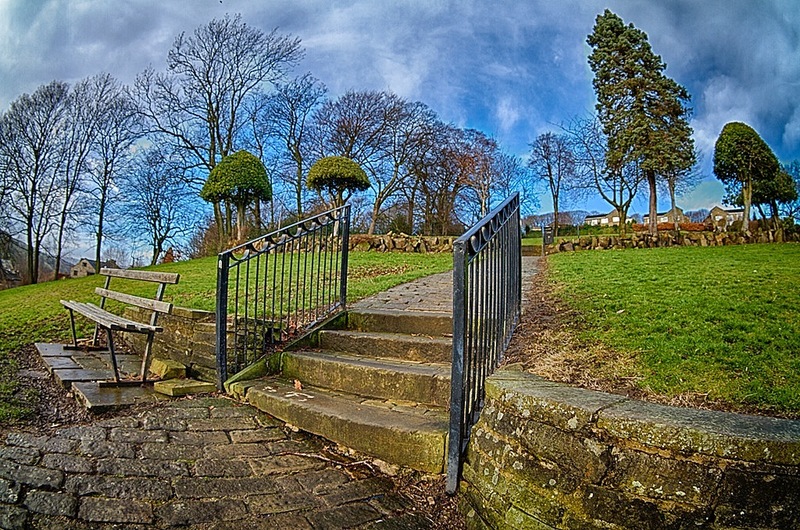 After I had my hair cut I crossed the main road in Holmfirth and went up into Victoria Park and was amazed to see blue in the sky between the clouds. As with the picture of the benches in the other park area, I was very close to the railing when I took this shot. 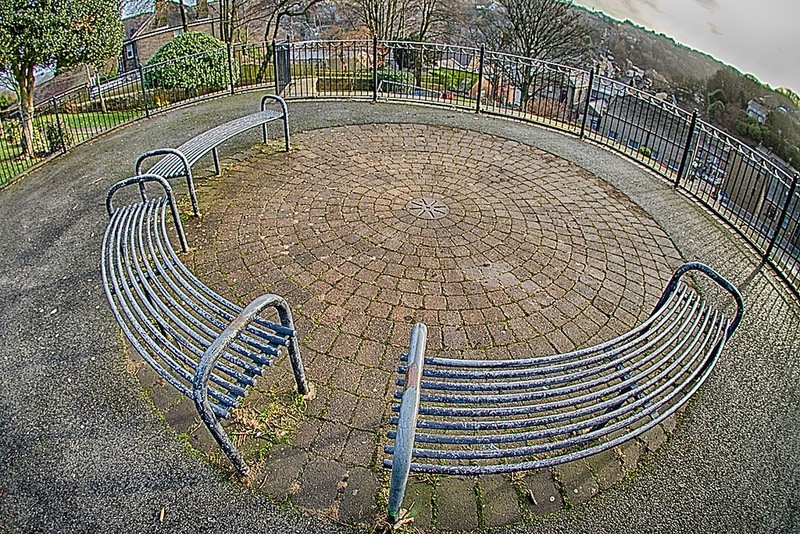 This is a gift of a subject for a fisheye lens with the circular pavers, the rounded metal benches and the curved railings around. My main problem when taking the photo was trying to make sure that I didn't get my feet in the picture because the camera was pointing downwards quite a lot. After leaving Victoria Park I walked up the hill above Holmfirth for this final picture. At the top of the hill the land flattens out and there are a few fields here stretching towards Upperthong. The clouds were moving away to the horizon and leaving a big area of blue sky above me. I pointed the camera upwards to take in the whole of the old airplane vapour trail which looks to be radiating out from the sun behind the clouds. The lens distortion has made the horizon wrap upwards at the edges and the yellow sun has lit the wet grass up in a beautiful way. 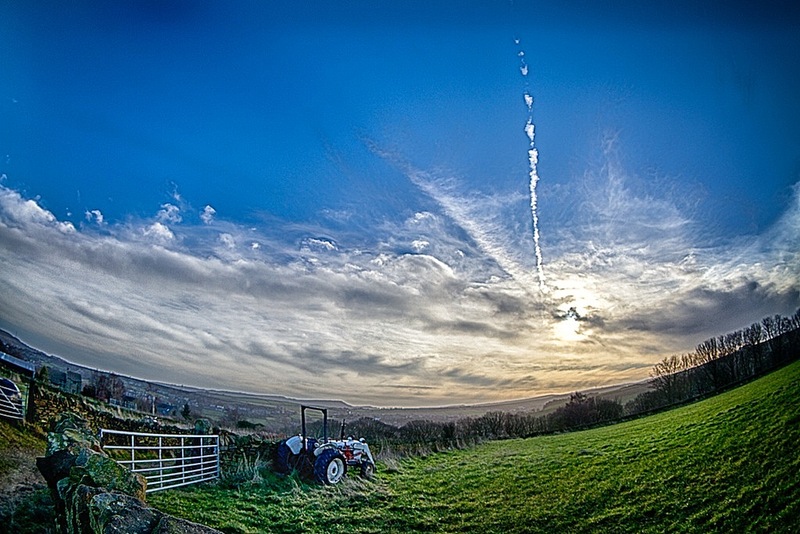 The white tractor and gate make very good foreground subjects to the picture. Taking photos directly into the sun can be a bit problematic but I think that this was the best photo of the morning. I don't have a batch of photos for the next post as yet. I may have to look back through last year to find something if the weather doesn't do something interesting soon. Maybe some photos from France may encourage the sun to come out. We've had a bit of a respite from the rain the last couple of days. Unfortunately I seem to have gone down with "man flu" so I'm not feeling much like getting out and about. 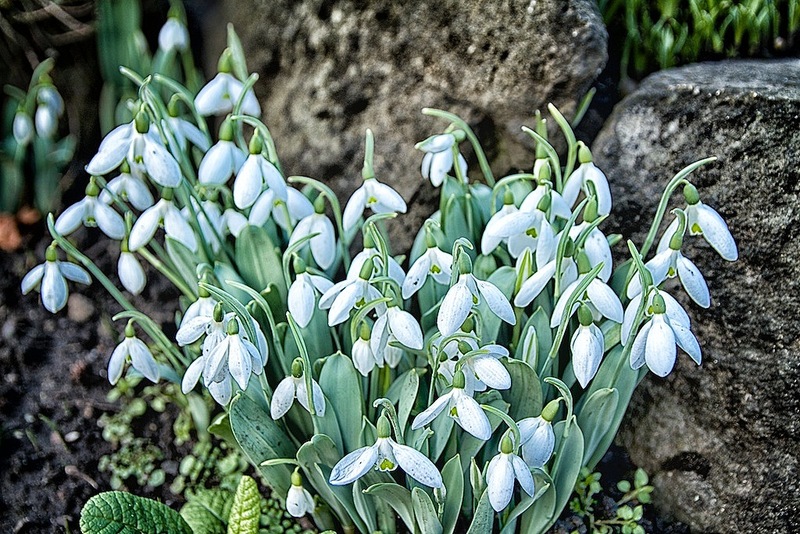 However we popped out to Beaumont Park just before lunch today and I was very pleased to see lots of signs of spring on the walk and even a few early flowers adding a bit of colour to the landscape. 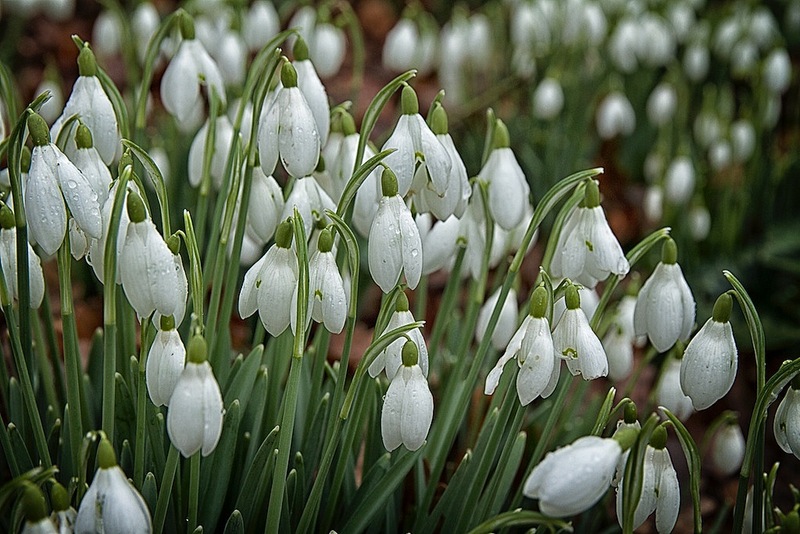 So here's a few of the photos that I took earlier today starting with some snowdrops. 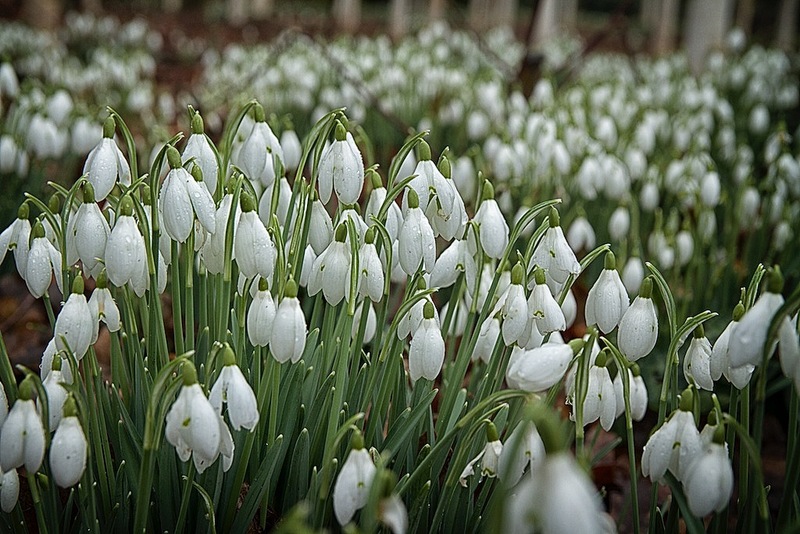 A closer shot of the snowdrops from low down. I had to take the camera strap from around my neck and use the screen to compose this shot. 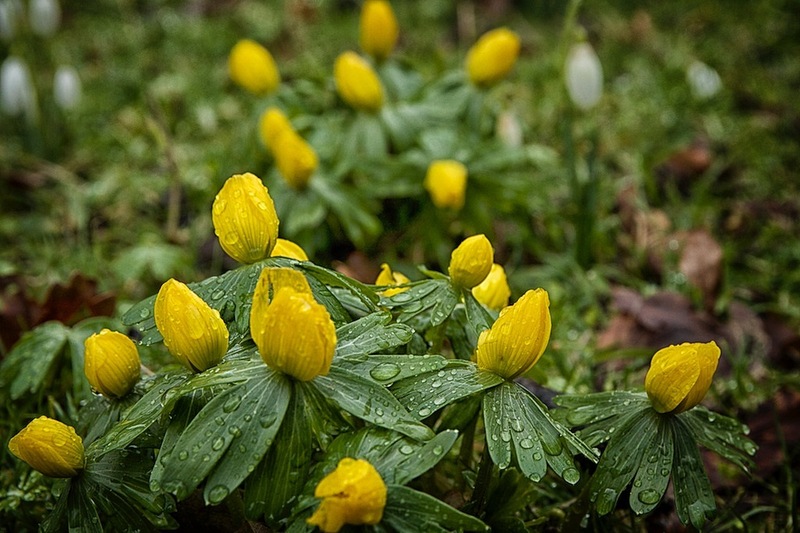 ... and some yellow ones too. 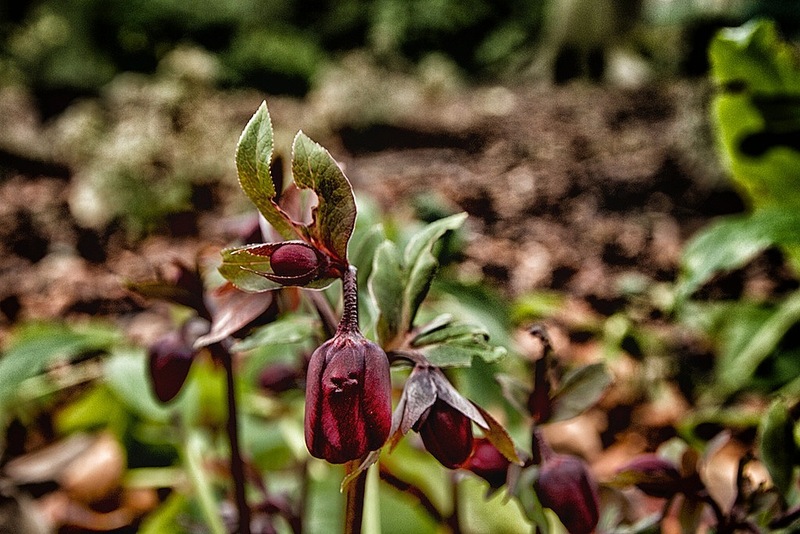 Not being an expert on flowers I had to look these next ones up and I hope they are Hellebore or Christmas Rose. 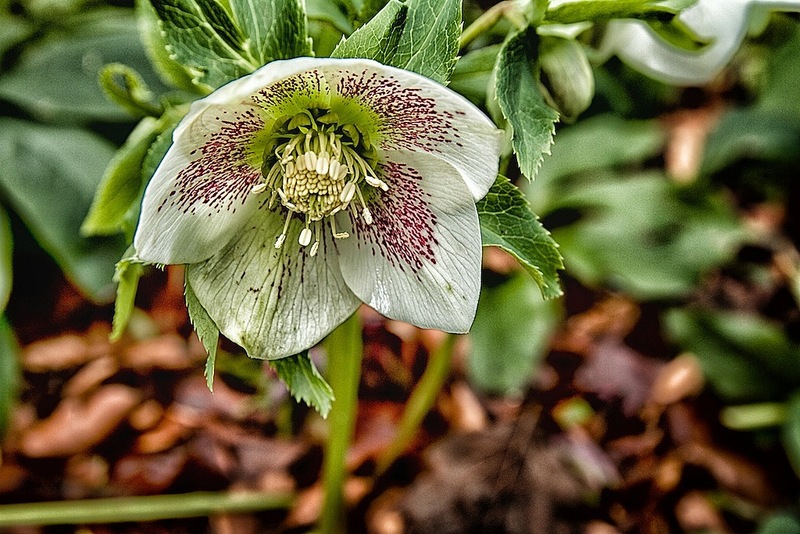 These are more Christmas Rose which are purple coloured and have not opened yet. 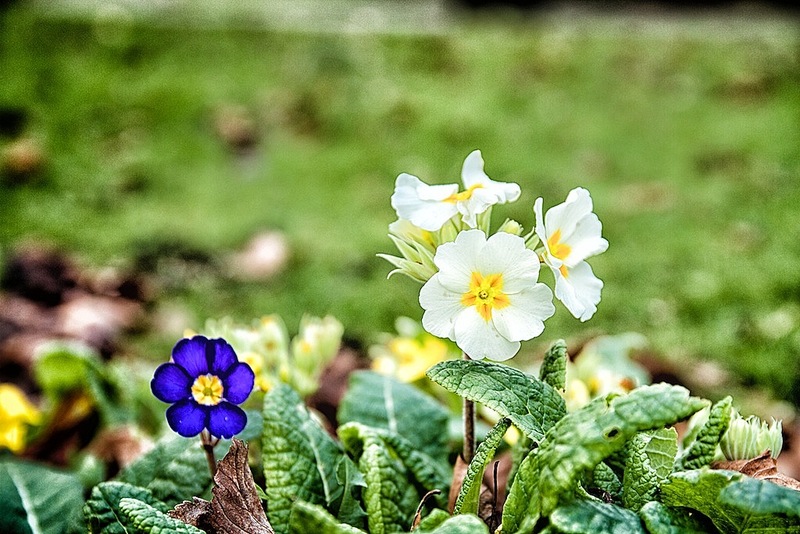 Some more primrose, white ones again and also a lovely vivid blue one. I tried looking these flowers up but I wasn't sure where to start. 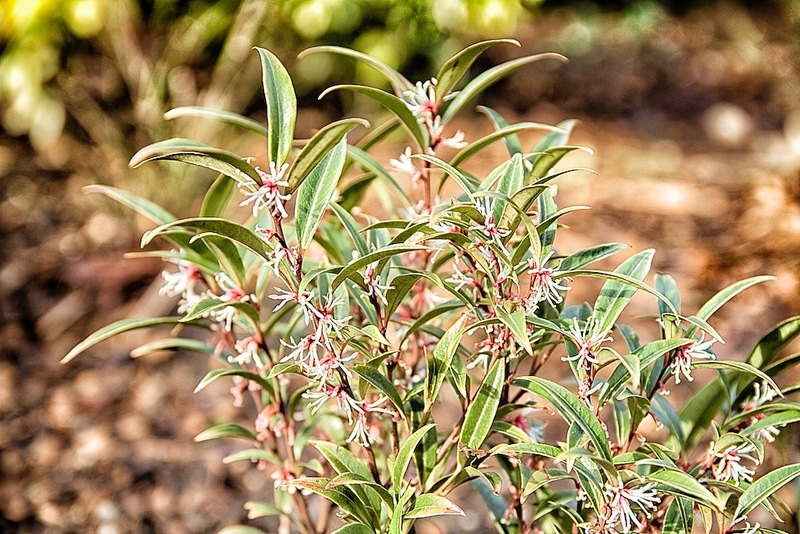 The leaves look a bit like hebe or maybe a pieris but it's probably something completely different. Another unknown flower which looks a bit like an iris but is probably something else. I wish I knew more about flower species so that I don't sound so dumb when I make these posts.